Thy Hand Hath Provided: Do You Do This? Well, You Should. Do You Do This? Well, You Should. I don't mean to sound bossy or anything. Really, I don't. If anything, I'm talking to myself here. That's how I felt when it all of a sudden occurred to me that instead of pulling out my same recipe binder or cookbooks for the recipes we make repeatedly every time, over and over, I could just tape the recipes to the inside of the cupboard right above where I usually work. Duh. So really, I'm saying this to myself, "You didn't do this earlier? Well, what was wrong with you?" The recipes we make weekly are yogurt, granola, baked oatmeal and pizza dough. There are a few others taped up there, too- Strawberry Brunch Souffle (strawberries are coming soon!!) and Fruit and Oat Muffins. 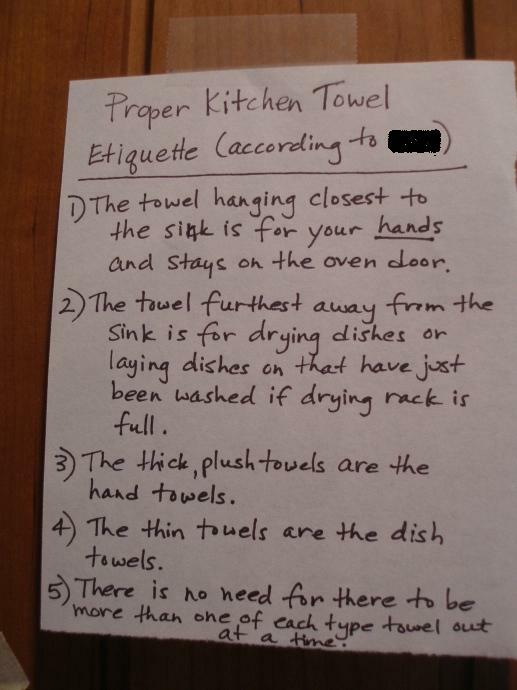 Then there are those all important reminder notes like, Kitchen Towel Rules According to Me (above), and what items we have in the pantry already so shouldn't be added to the shopping list (below). Three bottles of canola oil? Really? Spices? Why in the world so many extras? Crucial information, people. Who would have thought that something so simple would make so much sense? Please tell me you tape things to the inside of your cupboards. I don't, but my mom does. I think it will be one of those things that makes me cry someday when I'm going through her house after she's gone. Yup, that looks like my cupboard door, though instead of dish towel rules, I have a list of food combinations that make complete proteins. and now that you remind me, I should probably paste a few more recipes up there...egg custard, vanilla pudding, quiche (can you tell we are dairy farmers?!?). Hmm, and maybe my pie crust recipe, too. Yup, I'm off to do this right now! I do, once in a while. My starter's feeding schedule is up there, but I rarely refer to it. I don't...YET. :) I did just read a blog post from a woman who'd moved her elderly parents out of their home after 40 something years. She talked about this...and has wonderful memories of this and that taped to the inside of her mothers cabinets. Not only is it handy...it's sentimental! You know, it's usually the simplest solutions that are the best. I don't have anything taped to the inside of my cabinets, but it's time I re-think that. I do have a menu and master grocery list on the side of my frige, though. Does that count? I tape my child's lunch menus to the inside of the cabinet door closet to our lunch making supplies. We just open the door to see if we need to make a lunch. Easy Peasy! The Pioneer Woman had a post about a month ago with pics from her Grandmother's home. Many of the pics were of bible verses and other inspirational articles her Grandma had taped to the insides of her cabinets. Decades of them. Great idea about keeping the most used recipes on the insides of the doors! 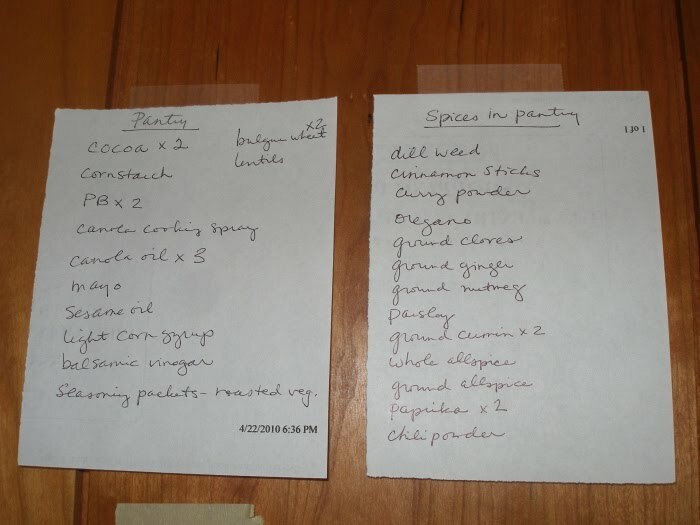 I really should do the pantry list. I currently have three bottles (jars?) of ground cloves in my pantry. Apparently I bought one each time I went to this store this past holiday baking season. My late Grandma Jean (who I miss SO much) taped a wealth of info inside the kitchen cupboard nearest the phone. Everything was neatly typed or clipped, including: VIP telephone numbers (including movie theaters & airlines), directions to her condo, a little map (even though SHE didn't need it she kept it handy to give directions), the names of her grandkids teachers, etc. Had the woman been born 50 years later, she'd have been a CEO somewhere! But, I have a lovely, crafty friend who took some of that handy, dandy chalkboard paint, and painted the inside of her cupboards with it. 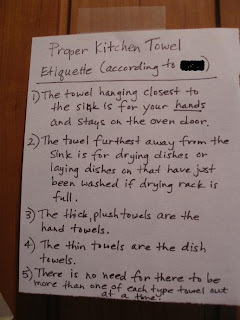 That way, when she's done with the list (or note to babysitter, etc), she simply washes it (and saves a tree!). Love this idea, and may very well do it myself! Hmmm... I never thought of that. I do keep a copy of the Dirty Dozen taped inside, but that's it. Thanks for sharing a good idea! Yes! I love this! Because it keeps info handy, but doesn't create visual chaos (with children and their activities, there's enough of that!). In the cupboard above our phone are lists of phone numbers and emergency info for babysitters. In another cupboard are my daily routines and cleaning chores. 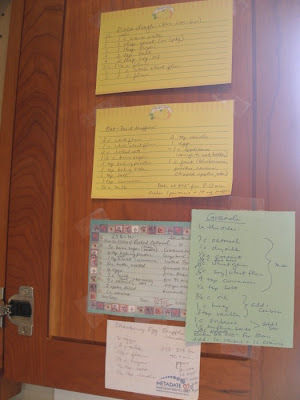 I keep my grocery list, menu, things to buy, and weekly to-do list on the side of the fridge. Maybe I should blog about this soon - thanks for the idea. I'm going to make the spinach crepe filling this afternoon for dinner tomorrow evening - thanks for the recipe. I have one recipe on the inside of my spice cabinet. Other cabinets have pictures taped inside - photos of family and my dog (now in heaven) as well as inspiration pics for future kitchen projects (paint shades and new countertops). The photos especially give me a little lift each time I open that door. Oh man! Great post! Bummer thing for me...we don't have cabinet doors...just open shelving :( Maybe I could tape it on the pantry door though :) This is great info! And you make me feel so normal....I love knowing that I'm not the only person who has a certain towel for drying hands and another for drying dishes ;) THANKS!!!!!!! I've been adding and subtracting to the inside of my cupboard doors for 21 years now. It is the handiest thing to just open the door where all the staples are kept and there is the recipe too. as I can see, I am so glad I am not the only one! I used to have cereal rules posted on the inside of the cereal cupboard, but now we don't eat commercial cereals, so I don't have to. I also used to keep rules about what side of the sink could hold what kind of dishes (L-rinsed/R-unrinsed). Thanks for the recipe tid bit- I'm going to use that! Love the idea. 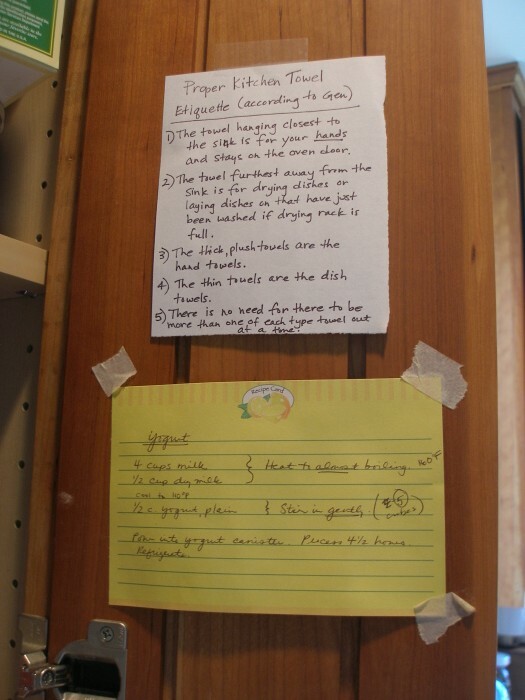 Once in a rental house I lived in I found a biscuit recipe taped to the inside of a cabinet door. It was clipped from the local newspaper 40 years previous. When I moved I took it with me. It is in my recipe binder currently. Maybe I should tape it up! Kitchen cupboards - list of trash and recycling collection days. Post box collection times in our local area. We still have our pinboards with childrens activities timetables, trips, etc, but at least the cupboard doors can hide some of it away!